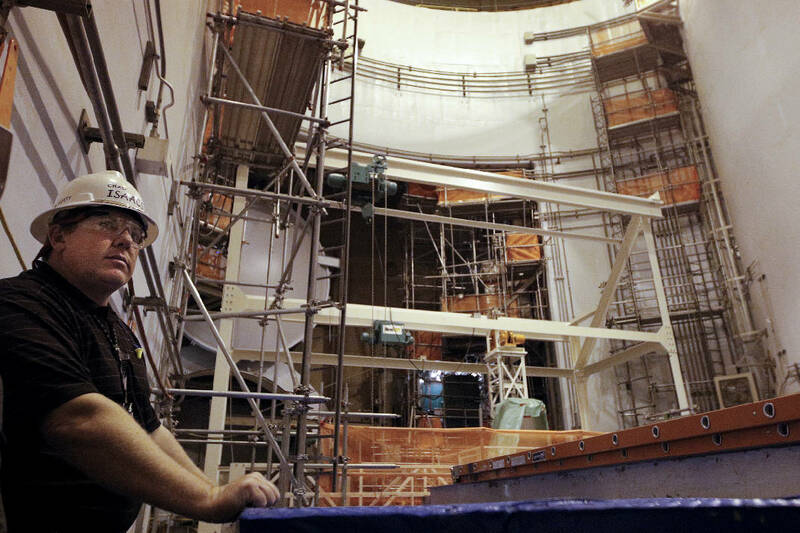 Chad Isaacs stands inside of the Unit 2 reactor containment area during a tour of TVA's Watts Bar nuclear plant in Spring City, Tenn. TVA plans for the nuclear plant's second reactor unit to come online by the end of the year. Nearly 43 years after construction began on the Watts Bar Nuclear Plant, the Unit 2 reactor at the Spring City, Tenn., plant is nearly ready to begin power production. The Tennessee Valley Authority, which has spent more than $6 billion on the 1,150-megawatt reactor during a series of starts and stops in construction since 1973, said Tuesday the unit is 99 percent complete and key operating systems have been tested and proven to be in good working order. Watts Bar Nuclear Plant Unit 2 licensing timeline as of June 19, 2015. The latest round of plant assessments, called hot functional testing, demonstrated equipment performed as designed and nearly 60 important systems operated effectively together. Over the past two months under inspections by staff from the U.S. Nuclear Regulatory Commission, Watts Bar operators used the heat generated by plant equipment to increase the temperature and pressure of systems to normal operating levels. The unit's main turbine was also rolled up to normal operating speed using the plant's steam. "Successful completion of these tests demonstrates the key operational readiness of Watts Bar Unit 2 in preparation to load fuel," said Mike Skaggs, senior vice president for Watts Bar operations and construction. "Good work by our team has brought us to where we are today as we validate the unit's ability to operate safely and the station's readiness for dual-unit operation." NRC commissioners have voted to grant TVA an operating license for Watts Bar Unit 2, provided that its staff certifies that the plant, equipment and staff are ready. TVA expects to begin generating power from the new reactor by the end of 2015. TVA President Bill Johnson said the Watts Bar Unit 2 construction that was resurrected six years ago after decades of delays "is now on time and on budget" and he hopes to soon gain an operating license for Watts Bar Unit 2 to become the first new nuclear unit to be added to America's electric grid in the 21st century. The last U.S. reactor to begin operation was Watts Bar Unit 1, which TVA began generating power with in 1996. "Loading fuel (at Unit 2) we expect sometime this fall — currently sometime in the month of September," Johnson told industry analysts last week. "But at this time, we're trying to make sure we do everything just right." TVA will next conduct additional testing focusing on the integrity of primary containment and related safety-related equipment, including tests of its emergency diesel generators. NRC spokesman Joey Ledford said completion of hot functional testing "represents a significant accomplishment by TVA" and tests are beginning now on the new unit's containment system. Once complete, Ledford said the NRC will issue a final readiness memorandum and the director of nuclear reactor regulation, Bill Dean, will then make a decision about whether to issue the operating license for Watts Bar Unit 2. Even nuclear critics have lauded TVA's recent efforts toward finishing and testing the new reactor. "TVA deserves credit for a well-managed and well-conducted transition from construction phase to operational phase," said David Lochbaum, director of the Union of Concerned Scientists' nuclear safety project and a member of the Community Action Panel that TVA established for Watts Bar Unit 2 last year. But Lochbaum suggested the TVA should not be too gleeful about its schedule for the long-delayed project. TVA's presentation to the NRC last month suggested that fuel load would come in July, not September. TVA first began planning for the twin-reactor Watts Bar plant nearly a half century ago. "If speed kills, TVA's pace won't even leave bruises," Lochbaum said Tuesday. "Many nuclear power plants have been constructed, operated, and dismantled in less time than it took TVA to load fuel on Watts Bar Unit 2 (assuming it ever happens)."